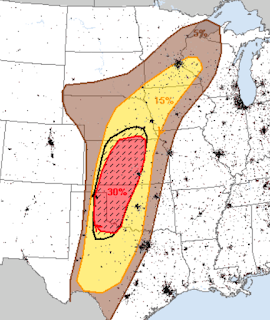 Here is the NWS Storm Prediction Center's outlook for severe thunderstorms and tornadoes (15%, yellow is the significant threshold) for Tuesday and Tuesday night. The hatched area is where the greatest threat -- especially for tornadoes and very large hail -- exists. You can see that it lines up reasonably well with the tornado forecast as I see it (scroll down). For residents of the hatched area, I recommend making sure your weather radio has fresh batteries and that you be aware of the risk so you can plan for your children or infirm friends or relatives. What time is this bad boy expected to come into our area in Wichita?